A new book, Soldiers, Spies and Spartans, that highlights the role of several children, youth and women in the Civil War is the topic for the March 17 meeting of the Auburntown Historical Society. "Our February program about the World War II maneuvers in Tennessee drew more than 60 members and visitors," said Mary Hughes, president of the Auburntown Historical Society. "We are inviting everyone to join us as the author discusses this often overlooked aspect of the Civil War in Tennessee." Published in January by The Overmountain Press in Johnson City, the book was co-authored by Dr. Calvin Dickinson, a retired professor from the Tennessee Tech University history department and the author of more than 20 books, and Cookeville writer Jennie Ivey. The authors traveled across Tennessee to learn more about their stories and visit the places associated with them, completing more than a year of research. 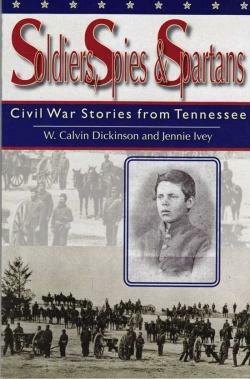 Among the stories included are those of Union Private Elisha Stockwell at the Battle of Shiloh, Confederate Spy Ginny Moon, Chickamauga drummer boy Johnny Clem, the McGavock and Carter children, who experienced the bloody Battle of Franklin, boy hero of the Confederacy Sam Davis, hanged as a spy in Pulaski, and young slave Hanson Caruthers, who witnessed the Battle of Nashville. The 87-page book is illustrated with original and archival photos and contains suggestions for further reading as well as explanatory sidebars for enhanced understanding of the time period and customs, giving context to the tales told. The book is $10 and will be available for purchase for a book signing after the AHS meeting, which begins at 7 p.m., Thursday, March 17 at the Fellowship Hall of Auburntown Church of Christ. Should be an interesting program. 150 years since the rebellion began and the nation saw the treason of Lee and the other West Point graduates who thought this nation was "These United States" and not "The United States." Would it have been treason if the South had won? Would we be "The United States" 150 years later? "Governments are mostly born out of Revolution"
I guess I differ a little dailyreader because I don't think of Lee as being treasonous. From everything I have ever read about his decision to command the Confederate Army instead of the Union Army (as he was asked to do), it was primarily due to the fact he could not fight against his home state of Virginia and not because he was against the "United States" or the Union. Technically speaking it could be considered an act of treason, but I view the entire Civil War as more of a mutiny on the parts of some and definite treason on the parts of others. Are the rebels in Libya committing acts of treason, or fighting for their freedom? Take a look at the oath the cadets took at West Point. Was it to defend their home state or the Constitution and United States? The South had yet to recognize the supremacy of a federal government-- that was evident by the nullification acts some southern states passed and seccession--unconstitutional then and now. Libyians suppressed by a dictator and rising up in rebellion against that dictatorship smacks of a horse of a different color then what was taking place during the 1860s. Unless one assumes the federal government of that day was, in fact, a dictatorship. Which some in the south thought so. If the south had won, would the Negroes been freed or shipped off to Liberia or? Would we now be the Confederate States of America and not the United States of America or perhaps a union of states but not united? Are we "united"? Would one not find start differences today between the people of Mississippi and, let's say, New Hampshire? dailyreader, you are correct about the oath had Lee committed the acts as a Union soldier. However, Lee resigned his commission before he joined the Confederacy. So in my opinion he was not bound to that oath he gave at West Point. Therefore, I don't view it as treason. And as a whole, I think if the North had looked at it as the text book definition of treason under the Constitution they would have shot every single Confederate soldier captured. But, I think a lot of people viewed it as war or insurrection more than anything. Had I been in that time period I think I would have struggled on which side to join. I believe my mind would have been pro-Union, but I do believe I would have had great difficulty fighting against Tennessee and especially Cannon County. Sounds like a good book by the way. Also, I don't think if the South had won the black population would have been shipped anywhere. I do think it would have set America back years from finally abolishing slavery. And Kevin, I do believe we are "united". We may have some cultural differences between places like Mississippi and New Hampshire, but if we truly went to war or had to come together for one cause I think we would be strongly united. And I too agree Libya is a little different than our Civil War. I find it more similar more to our Revolution versus our Civil War. Mr Halpern--interesting about New Hampshire and Mississippi--almost like Rhode Island and South Carolina when it came to ratification of the Constitution. Would Arnold been quilty of treason had he posted a packet to Washington, resigning from the Continental Army, one hour prior to contacting the British? He would have committed his acts as a Tory then. What if Lee, instead of waiting for over a day, enlisted in the CSA minutes after tendering his resignation? Just curious about your thinking and not confrontational but interested. I have often wondered how the two hundred or so West Point grads who were officers in the CSA justified their actions. Having had ancestors on both sides of this "late unpleasantness", I have never considered one less patriotic than the other. They were both serving and fighting to protect their homeland. Neither owned slaves nor large amounts of property. Patriotism was no stronger in the North than in the South and neither had a monopoly on their desire to support the ideas and issues they felt in their hearts. Well daily it is a dilemma and a conundrum about Arnold. I read a book a few weeks ago on Washington by Ron Chernow and he devotes a couple of chapters to Arnold around chapter 31 if I remember correctly. A good book if you have the time to read it. I think Arnold is alot different from Lee because Arnold had a plot to turn over West Point while he was an actual officer of the Continental Army. Lee resigned from the Union Army and made it clear he could not fight against Virginia, although he did not wish to see Virginia secede. I think if Lee had become Commander of the Union forces and then say conspired to hand over Washington, D.C. he would have fallen in the category of Arnold as treasonous and a traitor. I think the Union officers who resigned and joined the CSA were, like Lee in many cases, torn between their perceived duty and their loyalty to their state, families, homes, etc. We are talking about people who could possibly be fighting in their home towns. Arnold, although a good General while serving with the Continental Army, was more inclined to the fame and glory vs. Lee who I think was more bound to honor and duty to his home state. As I said earlier, I feel I would have had a serious problem had I been in that time period too. My mind would have been Union, but my heart would have been Confederate. I guess I have never looked at the Civil War as being a war about treason. Technically, under the Constitution, I would say that it could be determined that it was treason. I have always just felt it was a war between the North and the South over what they felt was states rights vs. the government dictating what they could and could not do. In the minds of the Southern people, I think they viewed it somewhat similar to the American Revolution and the authoritative power of the King of England and not as treason against the United States. We are in our own civil war today in America I think. You and I are a prime example. We are two people with many of the same interests and commonalities, but both too headstrong to give in at times over differences that should be settled much more peaceably and amicably. I am sure I really never get under your skin when I express my strong opinions against your ideals and comments, as you know by now that you do not bother me either. However you do confuse me at times when you post a comment like the one above because I am used to the confrontation and not the sensible, polite manner in which you asked my opinion instead of telling me what I should believe on a particular subject. I would hope that we can continue this recourse instead of the latter. And I wish it was where all elected officials could be on a local, State and Federal level as well! The following may make both your points valid. What makes both your points is that Lee did not get offered the command of all CSA armies at the time he resigned his commission as a colonel. He did not control all CSA armies until 1865, and by then the war had been decided. He resigned and accepted command of Virginia militia and was not in command of an army (combination of divisions or corps) of the CSA until 1862 when he took command because Joseph Johnson was wounded. As far as he being a traitor to the USA is technically correct. We in the south hate to think of Lee as a traitor to his country, but it makes the argument of “states rights” justifiably debated at the time since Lee could not bring himself to lead troops against his home state. At the time ones loyalty was with the state because a large federal government was debated as early as the writing of the constitution. Lee was only doing what so many others that had served, and were serving, were doing. Therefore, I think he could be labeled a traitor because I doubt he was fighting for Virginia when he was in Mexico 15 years before. However, I think it would be hard to find a better “American” who could have done what he did during the civil war. Technicality aside, I believe he is one of the best commanders of all time, and the only reason he lost the war is because the south could not provide him with enough manpower to meet the manpower of the north. As for the south winning, Slavery would have been abolished because the CSA would need to open its border to trade and other countries would not have put up with it much longer. It would have become a class system like serfdom found in Europe years before. However, now I am speculating too much and getting away from the facts and that is that the south never had a chance to win, and it’s probably a good thing they didn’t. Couple of interesting books that give an insight into state's rights and the strong feelings the Constitution needed amendments---Plain, Honest Men by Richard Beeman and Ratification by Pauline Maier. Not much has been written about the ratification process and Maier's book gives a behind the scene of what took place in some states. Chernow's book is excellent as his was on Hamiliton. Reading the Man by Pryor interesting on REL. Resignation from military obligations did not free them from being a citizen of the USA. Amnesty/pardons were given to most for their treasonous acts--Whiskey Rebellion and southern combatants-- Civil War. daily, I agree that technically it should have been considered an act of treason. I was just saying I never viewed it that way. I don't think the majority of the people in power did either or otherwise they would not have been pardoned so easily and allowed to take a simple oath to "re-join" the Union.